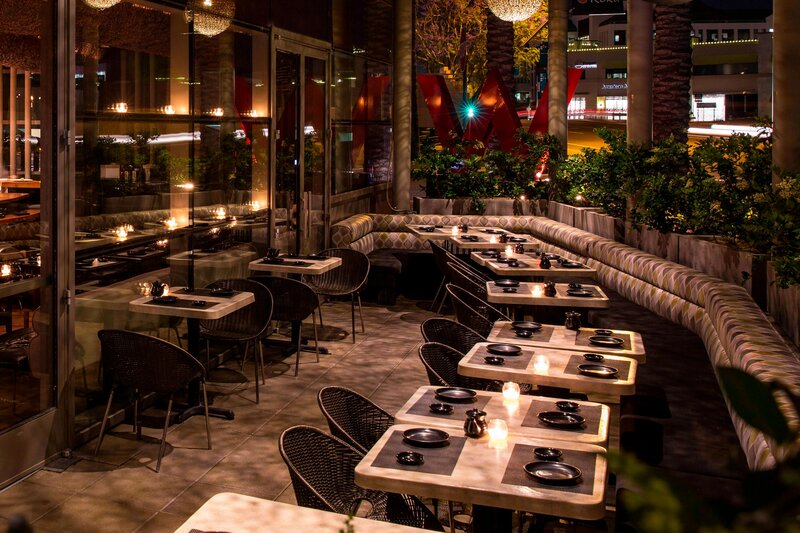 Start your night in downtown Scottsdale with dinner at the city&apos;s favorite sushi restaurant, Sushi Roku. Then, retreat to the fashionable Living Room lounge for innovative drinks and signature cocktails. See and be seen at Shade Lounge, our sophisticated indoor/outdoor bar, while listening to a DJ spin the hottest beats. Scottsdale dining in the comfort of your own sweet retreat. Experience culinary bliss without wandering far. Room service is available 24 hours a day for your convenience. Sushi Roku pushes the boundaries of modern Asian cuisine with a dazzling array of fresh sushi, luscious salads, thoughtful appetizers, and an extensive selection of hot entrees. Enjoy a signature "Omakase" dinner for a truly authentic Japanese experience. Party indoors against a dramatic backdrop of desert-inspired water & fire design elements or stay cool in the stylishly landscaped patio. Enjoy DJ beats, innovative drinks and VIP bottle service at Shade. Sip signature cocktails or enjoy VIP bottle service in this stylish lounge, where hotel guests mingle with Scottsdale locals. Enjoy the sultry sounds of local and national recording artists during Living Room Live, every Wednesday - Saturday. Soak up the sun and enjoy poolside service of chilled beverages and delicious finger foods. Each of our 13 private cabanas include W robes, slippers, flat screen TV & high-speed Internet access. For reservations, call or email vip@spellboundeg.com. This fine dining restaurant serves a four-course menu which is altered weekly. Experience fine Italian Florentine cuisine at Franco&apos;s.
This upscale restaurant is known for its prime-grade beef.